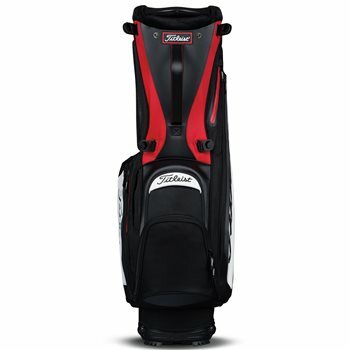 The Titleist Staff stand bag is constructed with lightweight high quality materials. It features a 5-way top for club organization. Other features of the bag include a new convertible strap system with high-density foam shoulder straps and a full contact hinged base. The Staff stand bag is equipped with 7 pockets, which includes a staDry valuables pocket and a tour-inspired magnetic accessories pocket.